Hmm, let’s see if I can remember how to write a blog post… It’s been awhile! How’s it going? Me? Oh, I’m great! You may have noticed that the blog has been experiencing some technical difficulties off and on over the last couple weeks. Let’s just say I do a lot better in the kitchen, not writing any css or html code or anything of the sort. I salute any of you readers who are into web design, graphic design, or any of that heavy computer-ey type stuff. Me on the other hand? Well, I stink to high heavens at it. Thankfully, Eric is as stubborn as a mule, and is able to find the answers online and get things up and running again. There’s a lot that goes on “behind the scenes” on the blog, and it’s not always roses. Sometimes It’s me having tiny panic attacks, worrying that the blog may crash, and I might lose years of content. Have I mentioned that some people *cough Eric* think that I maybe, possibly, kind of, sort of overreact sometimes? I’m not saying I do, but I know a few people who might say that about me, haha. Well, here I am! The blog’s still here, it didn’t implode. I don’t know how, but it didn’t. I might have gotten myself a fancy new wrinkle or two, but that’s about it. Now enough of my whining about the one thing that I don’t like when it comes to blogging. 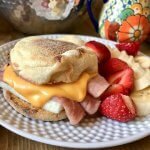 Let’s get down to what I love: cooking and sharing my recipes with you! The one good thing about the blog being a bit ‘on the fritz’ is that I took a little break from posting anything new, mostly because I was scared I might break it if I touched it. That meant that I just got to be in the kitchen on the daily, making new recipes! (Yay!) So there’s lots of good stuff to come. The holidays are here, and things are getting busy, but I’ll try my best to get them to y’all just as soon as I can! 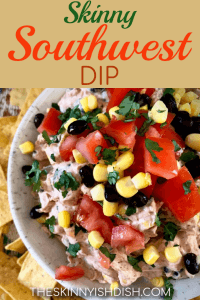 First up is this Skinny Southwest Dip that features some of the newest “zero point” items on the new Weight Watchers plan! Don’t worry, not everything is going to feature these items, I promise. But it’s new, and I want to make sure I am deliciously utilizing the new items in different ways for myself, and for you! Let’s start with a large mixing bowl. You’re gonna throw in a coupl’a cups of non-fat greek yogurt. (What? 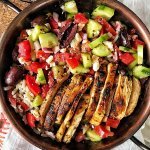 you don’t like greek yogurt and you’re about to run far, far away from this recipe? y’all, I promise you I hated greek yogurt for a very long time. 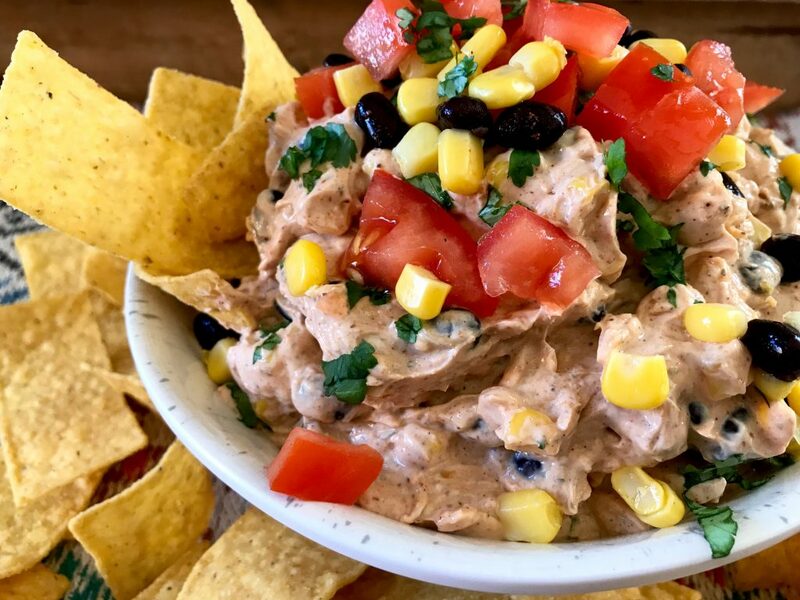 You absolutely do not know it’s in this dip. Trust me!) Okay, now that we’re past the greek yogurt situation you can also throw in some light cream cheese (there, see? 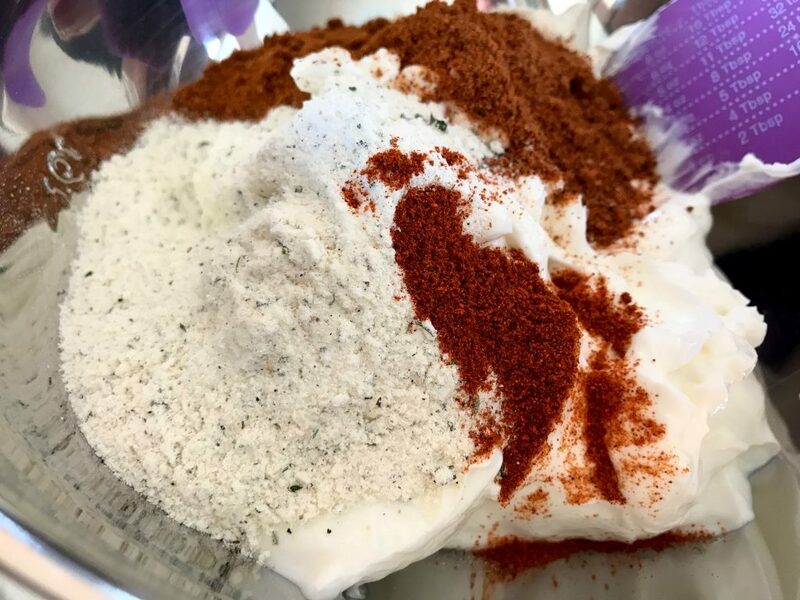 it’s alright), a packet of ranch dressing and seasoning mix, a packet of taco seasoning, and 1/8-1/4 tsp cayenne pepper, a bit more or less depending on the level of spice you prefer. 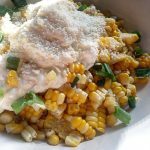 Of course you can make the ranch dressing seasoning and taco seasoning from scratch, but as ya know I’m a busy mama and I know y’all are busy too, especially during the crazy holiday season. 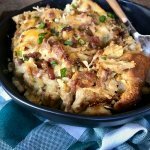 I tried to make this a “throw some stuff in a bowl and voila!” type of recipe… one that just about anyone could throw together for a Christmas party, potluck, girl’s night, a New Year’s Party, a Sunday Football game, etc. It’s really easy, and it’s really good! Everyone will love it. I’ve personally had a bunch of this made up in the fridge over the last few weeks, for Eric and I to snack on whenever hunger strikes. 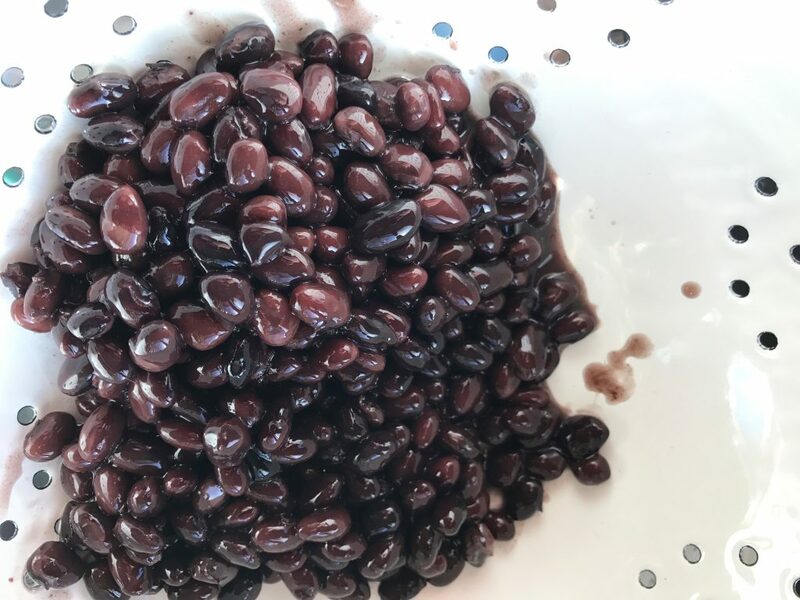 The protein from the beans and the greek yogurt makes it SO filling, and an all around perfect snack! Mix that all together with a mixer until it’s combined very well. Now grab a can of black beans. Drain, and rinse VERY well. 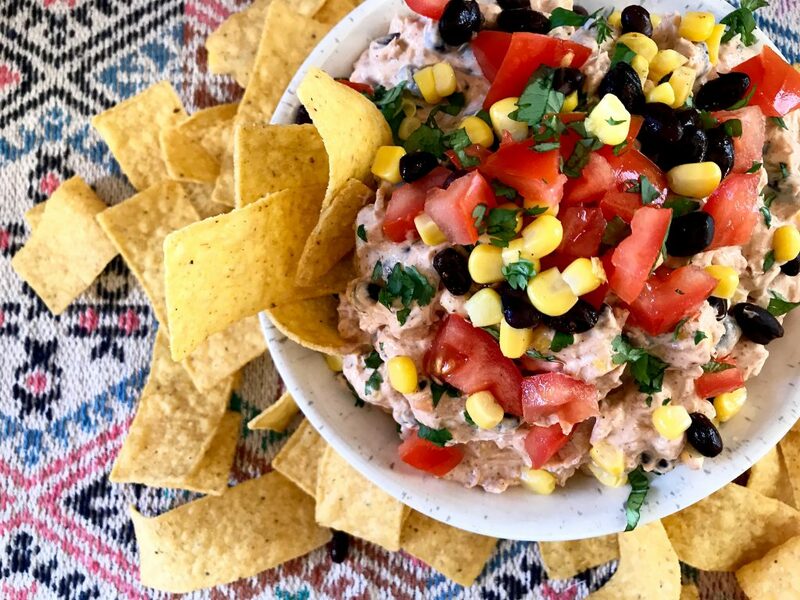 We don’t want any of that weird black bean juice in the dip now. 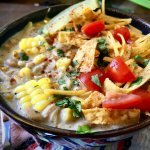 Add the black beans, a can of corn (also drained very well, but you don’t have to rinse it! ), and some reduced fat shredded Mexican cheese. Fold all of that together gently with a spoon or rubber spatula. 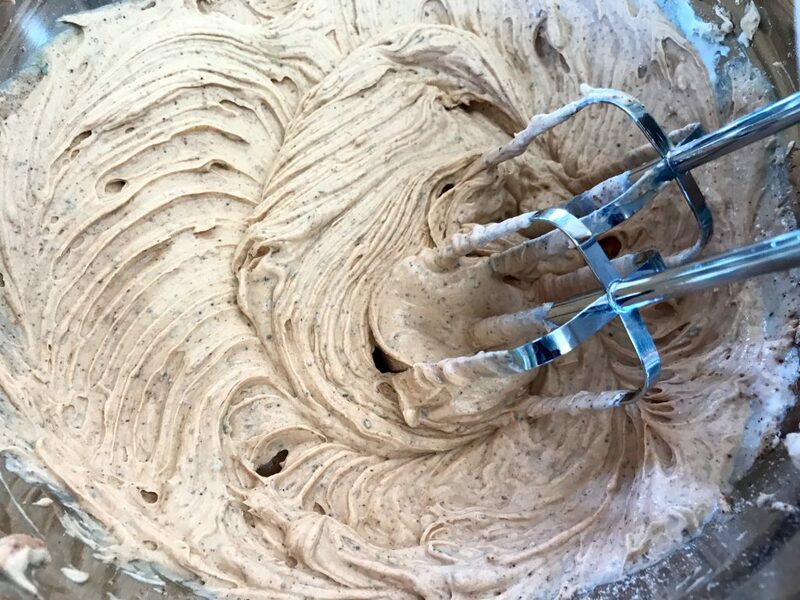 It does taste VERY delicious right after mixing it, but if you’ve got the time… try to let it sit in the fridge covered for at least 30 minutes, to let those flavors mingle a bit and do their thing. Aaaaand YOU’RE DONE! See how incredibly easy that was?? Seriously so delicious, and so easy. The dip itself isn’t much to look at. But honestly, do you know many dips that are? 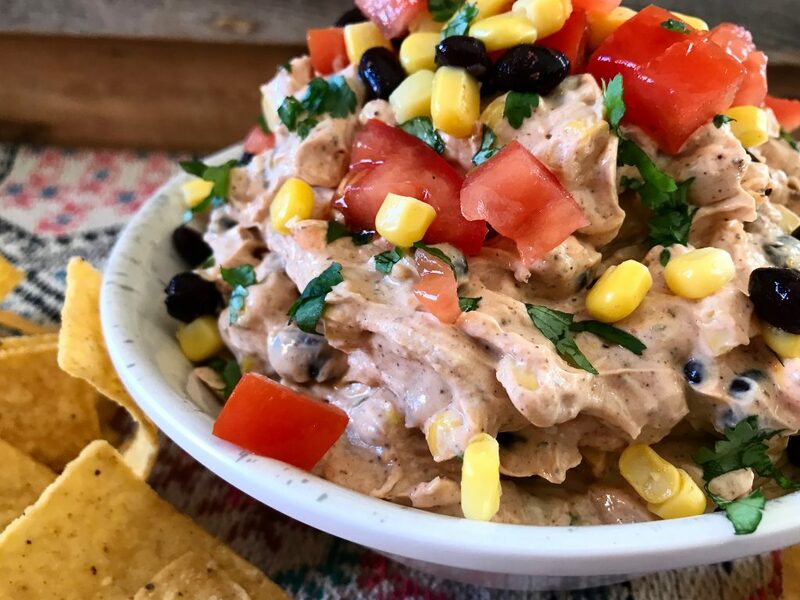 I decided to “pretty it up” by adding some extra things like fresh tomatoes, chopped cilantro, and some extra corn and black beans that I set aside when throwing them into the dip. 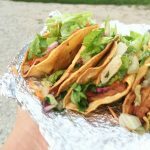 You can also add some lettuce, fresh jalapeño slices, green onions, etc., and It’ll instantly impress just about anyone. So it’s easy peasy, absolutely delicious, healthy, and pretty! Do yourself a solid and get in the kitchen and make this stuff as soon as possible. Pair it with some chips and/or vegetables, and you’re good to go! 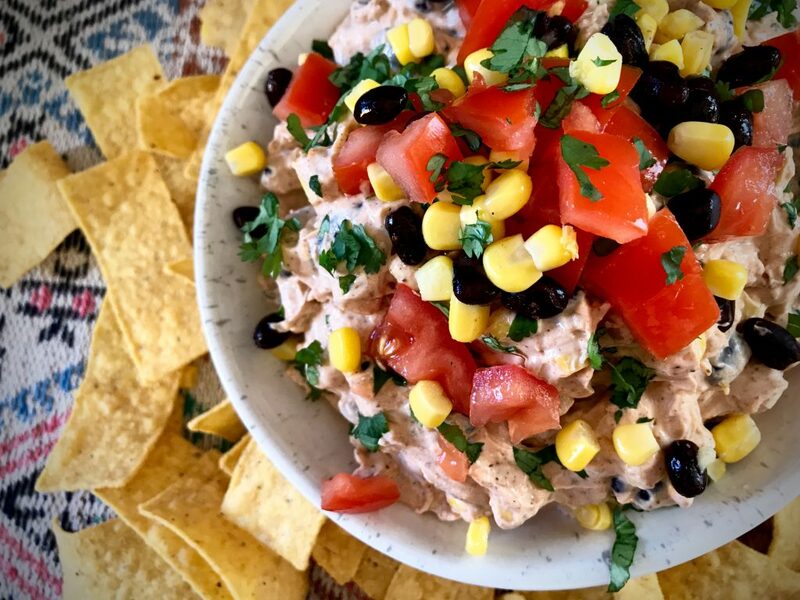 a delicious dip filled with spices, cheeses, corn, and black beans. 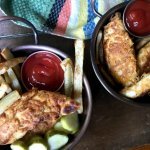 Perfect for snack time and even more perfect for any party! 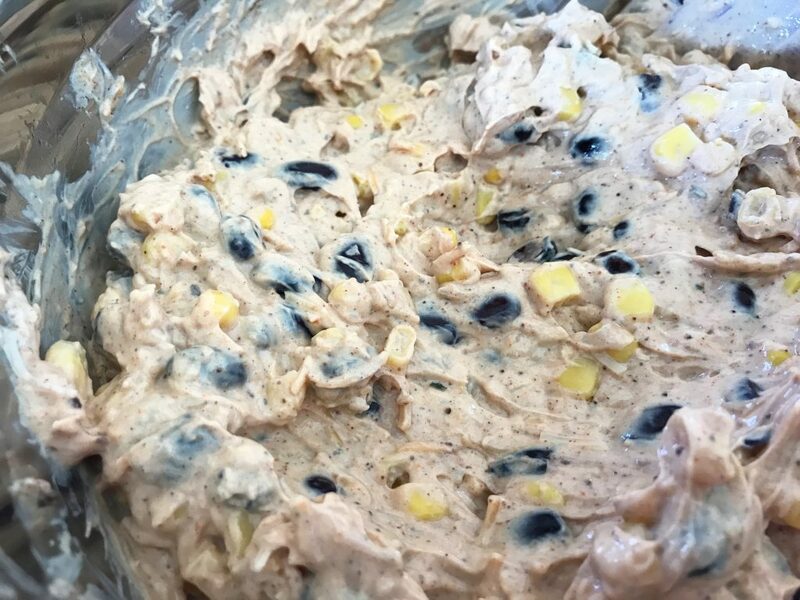 With a mixer, combine greek yogurt, cream cheese, taco seasoning, ranch seasoning, and cayenne pepper. Mix until combined well. 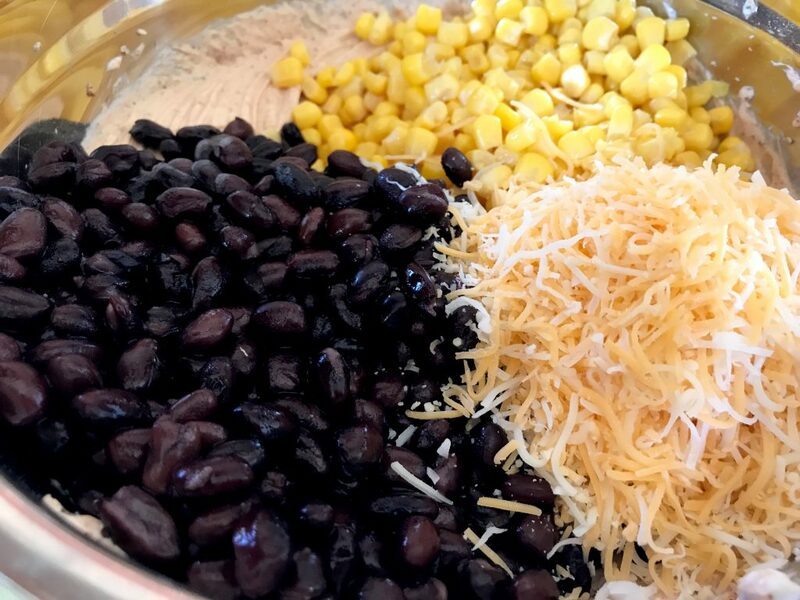 Gently fold corn, black beans, and shredded cheese into the mixture until combined well. (Optional) Garnish with freshly chopped tomatoes, cilantro, onions, jalapeños, etc. It's not needed, but it makes it a bit more presentable for a party! Made this for a Super Bowl party tonight and added a can of rotel-drained. OMG…so good! Everyone had a fit over it!!! Thank you so much! My friend (both of us on WW) turned me on to your site. I’ve made 4 dishes so far and, aside from less pickle relish in the cheeseburger pasta, have loved them all but this is FIVE STARS! Only change I made was adding a small can of diced green chilies. I only have one complaint. I can’t stop eating it!! Thank you for all the hard work you put in to these recipes! That’s a good complaint if I ever saw one! Good thing it’s pretty low on points, huh? Haha! 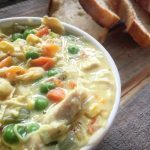 I’m so happy you have enjoyed the recipes you’ve tried! Thanks for stopping by to let me know, Monica! OMGOSH it is delicious!!! It’s a keeper! Thanks for all you do! Making the brined chicken tonight too. What a GREAT IDEA!!! I will have to try that next time I make a batch. I am so happy you and your husband enjoyed! Thank you so much for letting me know! Hi Jane! I think adding a homemade ranch seasoning would work perfectly- Just make sure it’s only about 2-3 tbs that you are adding. Any of’m should work to be honest they are all about the same that I’ve found. I wouldn’t double the taco seasoning. It would definitely be a bit too taco-y. If anything I would skip the ranch and just do one packet of taco! Hope that helps, let me know how it goes! Took this to a party over the weekend then to work – it was a HIT! So, so delicious! So good!! This with some celery will be my go-to snack for the next week. Yay! So happy you loved it. I love it with celery too! I made this for my husband and I on Saturday. After his first bite, he said “We can take this places.” I think that means he likes it. I thought it was awesome. Haha!! I’m so happy to hear that. 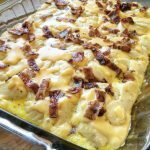 I just made this and it was easy and delicious! Thanks so much, Star. So happy you enjoyed! Thanks for letting me know! Just made it! I added a roasted Anaheim chile, spread the mixture in a casserole dish and topped with a can of drained rotelle tomatoes and green onions. Super yummy! Thanks! Yum!!!!! I’m so happy you enjoyed! Thanks for the idea-only had 1 cup of Greek yogurt, so I added 1 cup of light sour cream. Only 2 Flexpoints when I put it into the calculator. 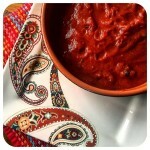 Makes a large amount and tastes great! Ooh, this looks amazing! I will be making this Xmas Eve! I never knew how much work went into creating and maintaining a blog. Thanks for painting that picture for us! Also, thank you for the continued recipes that feed me weekly! Can’t wait to try this with carrots and celery! I’ll be sure to tag you on Instagram.